Welcome! Award-winning singer/songwriter Juni Fisher! A talented entertainer with a strong awareness of California's bridle horse traditions. Born in California's San Joaquin Valley, Juni Fisher grew up in a farming family which included horses, 4H, FFA & countless singing performances with her two sisters. She studied Equine Science at college, rode young horses for clients & became a regular in Quarter Horse, Arabian & open shows while earning money singing big band standards with a dance orchestra. Early adult years she trained cowhorses from the snaffle to the bridle winning her first Snaffle Bit Futurity in 1981; her first Bridle Horse Championship in 1983 [Monterey Classic] all while she worked on a cow/calf operation and ran a roping arena - her bridle horses did day work on the ranch and arena competitions weekends. At campfire gatherings, Juni played guitar & sang songs of the west she learned from her father. In 1984 relocated to southern California & worked for a cutting horse trainer. Music & song in her heart, she played rhythm guitar and sang leads & backups with a local band; later worked in Los Angeles area clubs with a dance band playing western & cowboy music. Never far from horses & with ability to work various breeds and disciplines, she accepted a position as a foxhunting professional at a hunt club in Tennessee. Point-to-point racing, steeple chasing & horse trails took the place of cowhorses while she honed her songwriting skills among Nashville's finest. Her first Western release in 1999 reached the Monterey Cowboy Poetry & Music Festival, and within a few years Juni shifed to music as her full-time profession. Today she performs throughout the U.S. at major festivals and concert venues, splitting her "home" time between Tennessee & the San Joaquin Valley where she continues to ride and train her horses. 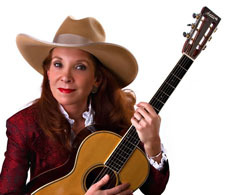 Enjoy VHD's Saturday evening Rancho Dinner & Juni Fisher Concert ! Her CDs will be available including her latest CD featuring "Listen" and "Still There" - both top award winning songs!